A variety of chemical substances are added to the product to ensure product quality and safety. However, with the development of science and technology, the risk analysis on how the hazards chemical substances affect the human body and the environment is gradually improving. When the usage of a certain chemical substance is currently an acceptable risk, it may become a controlled one in the future. As an international well-known brand of electronic products manufacturer, ASUS supports the precautionary principle set forth in the Rio Declaration of United Nations Conference on Environment and Development (UNCED). We expect that the regulations on chemical substances will become stringent. On the other hand, existing products or parts may contain potentially harmful chemical substances, and it might fail to comply with the regulations when they are discarded for recycling and thus could not enter the circular economy. Therefore, in addition to comply with the global regulations on chemicals substances, we also voluntarily control chemicals that possess potential risks to humans and environment. By using environmental friendly materials at product design phase, we not only drive the industry to enhance in the supply chain, but also improve the reuse value of and applicability of product wastes, facilitating the new material cycle. ASUS uses 4 management levels - GA, HF, EL and HE - to control the hazardous substances. "GA" is the fundamental requirements of ASUS. We combine industry regulations and trends of relevant non-mandatory control on chemical substances to formulate an internal technical standard which covers and manages more than 300 chemical substances, and further control the use of beryllium, antimony and red phosphorous in advance. In addition to restricting the use of hazardous substances, we also cooperate with our supply chain to evaluate the alternative chemicals to further reduce the environmental impact brought by the current usage. "HF" is short for halogen-free, which is one of the key target of ASUS’ chemical management. To reduce the flammability of plastic materials, fire retardants are added into the manufacturing process to prevent fire from spreading or to reduce spreading, and this capability has saved many lives. Halogen-based fire retardants are versatile, economic, highly efficient and highly compatible with base materials, making them widely used. However, research shows that halogen-based fire retardants cannot be recycled and reused, and waste incineration can generate fume, dioxin and haloid acids that damage the immune system, posing threats to human health and environment. Also, haloid acids can infiltrate halogen-containing components and render them non-reusable. This will gradually increase the risks to humans and to the environment, and contradict the goal of circulating economy. To this end, we established "GreenASUS Halogen-Free (HF) Technology Standard ". Starting with the first halogen-free motherboard in 2004 and the first halogen-free display (VW247H-HF) in 2011, ASUS has been continuously endeavored in halogen-free materials and technology and further introduced halogen-free policy in 2010. Each year, the compliance rate of new halogen-free components continues to rise, from 60% in 2012, 75% in 2014, and 78% in 2016. Meanwhile, we have committed to increase the ratio of halogen-free components and products with alternative technology without compromising product efficiency, quality, health and environment. Other than the technology and economically-implausible materials, such as system module, printed circuit board, adaptor and wires, ASUS has applied the halogen-free requirements to all components and seeks continuous increase of at least 3% annually, preferably 5%, with the goal of more than 85% halogen-free components by 2020. In 2017, ASUS encountered a headwind in the operations. Under the consideration of operation and of environmental factors, the compliance rate decreased slightly to 71.8%. To safeguard human health and the environment, ASUS uses all chemical substances carefully. We follow regulations that control their use, formulate technical standards that strictly require our suppliers to forbid their use. ASUS defines a hazardous chemical substance as a material characterized by persistent, bio-accumulative, toxic, carcinogenic, or mutagenic features, as well as possible reproductive toxicity or environmental hormone disruption. 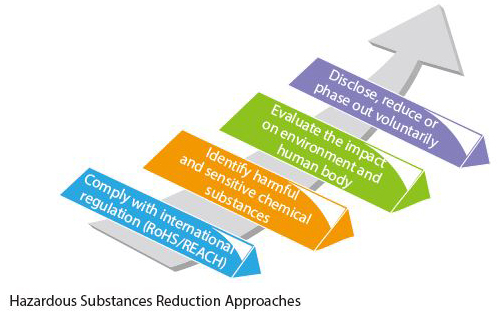 Regarding hazardous chemical substances management, ASUS is committed to meet the regulations of international chemical substances as the primary goal. All ASUS products manufactured since 2006 met the requirements by RoHS (Restriction of Hazardous Substances Directive 2002/95/EC). Besides Pb, Cd, Hg, Cr6+, PBBs, and PBDEs restricted by RoHS, we also manage Ni, PVC, TBBP-A, ozone depleting substances, radioactive substances and other harmful substances. When the substitute is available, we will gradually restrict the use of PVC, BFR, CFR, Be, Sb, and Phalates. In order to comply with EU REACH Directive which went effective in 2007, ASUS takes the manufacturer responsibility for disclosing the information of SVHC in our products. Please click HERE for the related information. According to our Precautionary Policy for Green Design, we control the hazardous substances from sources - that is, of the enormous supply chain. To improve efficiency, we use eGreen platform, SRM, for component approval process and ask our suppliers to provide the third-party test report along with the hazardous substances warranty letter. This could efficiently manage our green supply chain and ensure our green quality. The halogens or halogen elements are a series of nonmetal elements from Group VIIA of the periodic table, and the halogenated compounds such as Brominated Flame Retardants (BFRs) and Chlorinated Flame Retardants (CFRs) are widely used as the materials of the parts for electronic products, as the gluing technique, or as flame retardant for its effectiveness and economic advantage. However, if end of life products containing BFRs or CFRs are not properly treated and recycled, they will release dioxin and furan during the incineration process. Dioxin compounds are stored in biological fat, are hard to be metabolized, and will be cumulated through the food chain, thus leading to biological genetic damage and even causing cancer. According to the recent scientific researches, many halogenated compounds are proven to be potentially harmful to the human and the environment. Among the halogenated compounds, Polybrominated biphenyls (PBBs) and Polybrominated diphenylethers (PBDEs) may interfere with brain development and is carcinogenic, thus they are listed in EU RoHS Directive. In addition, TBBP-A (Tetrabromobisphenol-A) is one kind of BFRs and is used in the electronic products for its effectiveness and economic advantage, but it could pose great destructive impacts to the ecosystem. Another halogenated compound Polyvinyl chloride (PVC) is very popular worldwide for its convenience, stable characteristic and low price. Nevertheless, the plasticizer (phthalate) added during using stage will interfere with biological endocrine, and dioxin and hydrochloride produced by incineration at the disposal stage could cause serious environmental pollution. Based on the precautionary principle, ASUS has defined many halogenated compounds such as BFRs, CFRs, TBBP-A and PVC as hazardous substances and includes them into our internal standard "Hazardous Substance Free Technical Standard" and formulated "Halogen-Free Technical Standard" according to IEC-61249-2-21, which define the allowance concentration of halogens as followed: 900 ppm max for Cl, 900 ppm max for Br, and 1500 ppm max for total halogens. ASUSTeK has formulated "ASUSTeK GreenASUS Halogen-Free Technical Standard" in 2008 and encouraged our suppliers replacing halogen flame retardant with low environmental impact substances such as nitrogen compounds, phoshorous compounds, hydrates. We have phased in halogen-free on components with high risk, such as PCB laminate, plastic parts greater than 25g, and cable assembly. In 2009, we had introduced some halogen-free sample models to the market. Beginning from September 1, 2010, all newly purchased components, except system modules, PCBs, connectors and cables that still possess technical difficulty and are not economical viable, need to compile with halogenfree policy. ASUSTeK is committed to continuously increase the proportion of halogenfree components used in new products if alternative technologies are feasible and the technologies will not affect product performance, quality, health and the environment. We seek continuous increase of at least 3% annually, preferably 5%, with the goal of more than 85% halogen-free components by 2020. To learn about the policy, objective and achievement, please click HERE. According to ASUS Precautionary Policy, we not only banned substances that restricted in global regulation such as RoHS and REACH, but also controlled any substance that pose a threat to human health or the environmental. 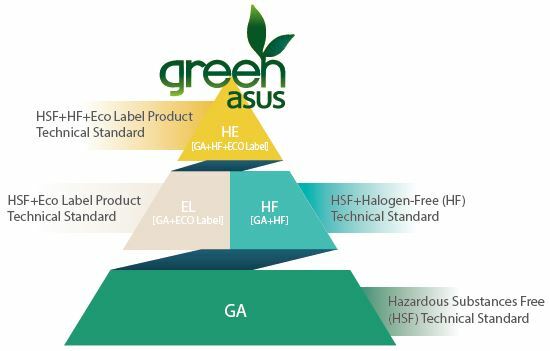 ASUS hold to a rigorous standard of environmental compliance as GreenASUS HSF Technical Standard to remove and replace toxics further and include them in our supplier contracts. Beryllium is Alkaline-earth metal and belongs to Group IIA of the periodic table. The substitutes are not found yet for its good metallic characteristic. Beryllium oxide has good performance in electrical physics, thermal physics and mechanical properties, so it is important to the use of electronic products. However, beryllium has an adverse impact on the human body during exploitation or waste disposal. In animal experiments, beryllium and its compounds is carcinogenic and toxic. ASUS had listed beryllium as Level 1 restricted substance, which meant immediately prohibit of usage, by early 2013. Antimony belongs to Group VA of the periodic table. Antimony trioxide is used for flame retardant. It is very popular in the market for its good characteristic and thus is difficult to phase out in a short-term. However, it could stimulate the respiratory and gastrointestinal and is toxic, and it is also a carcinogenic substance. In early 2013, ASUS had listed antimony as Level 1 restricted substance, but with exemption in certain parts.